The EU-funded ecoBirdy project starts with awareness actions in nursery schools in Belgium. And that's where we met designer Joris Vanbriel and his team one rainy November morning in Brussels. The Professor in his white lab coat (an actor) greets the little children. The excitement is palpable. Like with Saint Nicolas, some are scared, some quiet and others are literally jumping up and down in their seats. The Professor conquers them all, telling the story of what happens to their beloved toys when they are no longer wanted: 80% of plastic toys end up in landfills, incinerators or in the ocean. The EU-funded ecoBirdy project saves the toys from their fate. As they gather together in a brand new factory, they are transformed into colourful designer furniture for kids. Even Pixar couldn't come up with a better ending! The project has also published the story as a book for children: "Journey to a new life". The school activities are accompanied by a plastic toy collection action. Together with toys gathered through professional recycling centres, all of them are sorted by colour and shredded. The plastic is transformed into a new colourful material and then shaped into tables and chairs. It was a great experience to see the project in action! Having the project so close by, we managed to see the impact on the ground first-hand. We left the children sorting their used plastic toys and proudly shouting "I'm a recycler, yeah baby!" – a warm feeling in our hearts despite the grey sky! Ecobirdy is one of the 10 projects funded under the EU programme for the competitiveness of SMEs (COSME) 2016 Design-based consumer goods call. The first chairs will be presented to the market at the industry fair Maison & Objet in Paris. 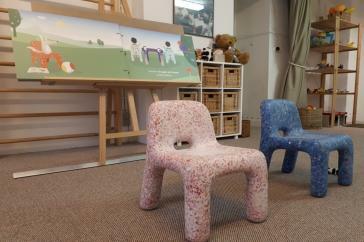 The first chairs can be ordered from the ecoBirdy shop.